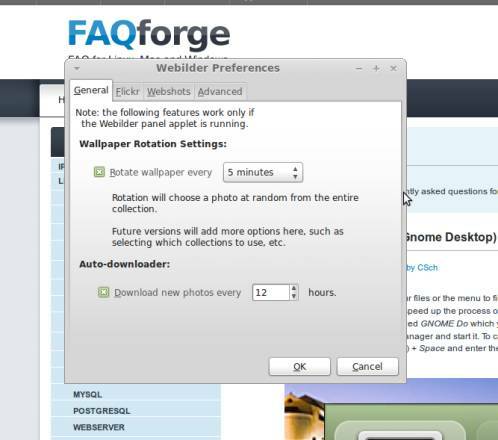 This article is about how to automatically change your desktop wallpaper on prespecified intervals with a software called Webilder that also downloads new wallpapers from flickr and webshots every few hours. 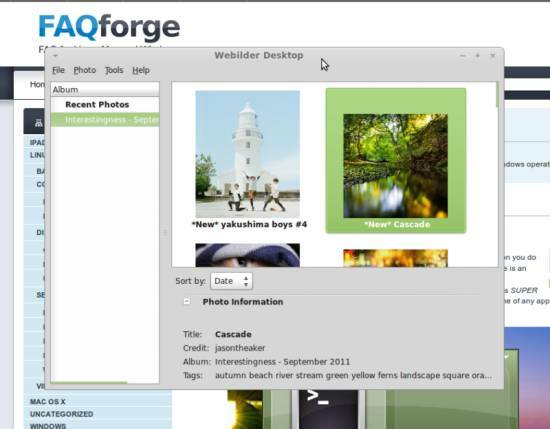 This is also the software used for rotating wallpapers in the Ubuntu derivative Pinguy OS. 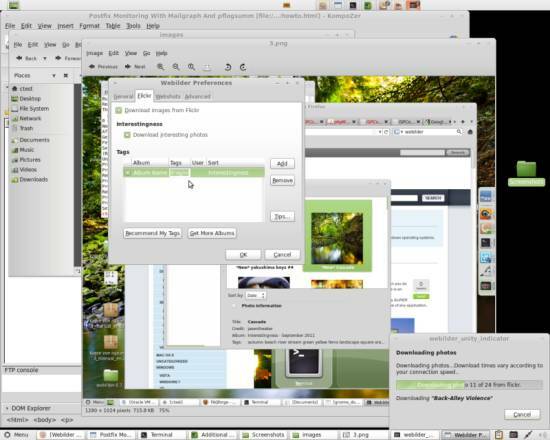 I have installed and tried Webilder on Linux Mint 11, however it should also work on all other Debian and Ubuntu based distributions. Be sure to replace my installation path (and/or username) with yours. If not started automatically, rightclick your desktop panel and select Add to Panel.... Browse the available applets and click on the Webilder Desktop Applet. Click on Add and the applet should appear on your desktop panel. If the applet was not available in the list of applets in the first place just restart your system and it should appear in the list. 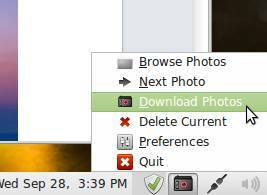 Leftclicking on the camera icon on the panel will give you the important menu points to deal with Webilder. To start with, select Preferences. Here you can specify the intervals of rotation and download of wallpapers, which wallpapers should be downloaded and where they should be downloaded from. To add filters, head to the flickr tab, use the Add button and click on the filter fields to configure it. mateconftool-2 -t string -s /desktop/mate/background/picture_options zoom;mateconftool-2 -t string -s /desktop/mate/background/picture_filename "%f"
This will set the wallpaper image in mode "zoom", but you can change it to "centered", "scaled", "stretched", "wallpaper"(tiled) or "spanned". The second command will just change the picture to the one selected by the program ("%f", don't forget the quotation mark).